Elizabeth was born into a family who started collecting Pop Art in the mid-1950s and was featured in 1965 in Life magazine. As a child she was exposed to some of the most influential artists of the day: Andy Warhol, Roy Lichtenstein, Robert Raushenberg and Frank Stella, among others. This artistic and aesthetic expression in her blood has been honed through education and training. She earned an architectural degree from NYU and realized soon after graduation that she was destined to work with artists. Elizabeth’s love for art and architecture is juxtaposed with her love for travel. In the mid-1970s, at the request of the Shah of Iran, she became the Curator of North American Art for the Niavaran Cultural Centre in Tehran. In the late 1970s she curated art collections for Bob Burns, Adrian Zecha and George Rafael at Regent International Hotels in Hong Kong, Sydney and Singapore. 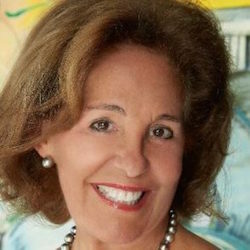 When Isadore Sharp purchased Regent International Hotels in the 1992, he engaged her to create museum-quality art collections for his Four Seasons Hotels – an on-going relationship that continues to this day. Her passion is to adorn the walls of her properties with multi-layered, thought-provoking international and authentic local artworks that blend just the right amount of style and harmony with their surroundings. The rise of “lifestyle” concepts and continued brand differentiation among boutique and luxury concepts have reignited the attention to design and construction that reflects authentic and local culture, or other aesthetic elements that offer unique guest experiences. We took the opportunity to have a fresh conversation with Elizabeth on this facet to the guest experience. Dr. Jim: In your experience, does the hospitality industry pay enough attention to aesthetics? Elizabeth: The aesthetic vibe in hospitality has become exponentially more valued by ownership, management and guests in the past 5 to 10 years. Art in hotels is no longer a secondary thought. It is now mainstream and is becoming a central part of the entire design scheme. Attention to the artworks has become part of the hotels’ identification directly impacting their marketing and branding. This is especially true in the luxury market, in large part, due to the wealthy clientele seeking culturally stimulating visuals in the places they stay. Hoteliers in the luxury market are taking these facts into account and catering to the art needs of their art savvy guests. Guests want to be seen as knowledgeable, smart and sophisticated. Many already own art and want to stay in hotels that are of their “artistic level” and sophistication. Guests want memorable experiences that are out of the ordinary. The clientele of luxury hotels consider hotel ambience and value the property’s art collection when they book their reservations. In short, my experience is that the industry is on the precipice of paying more attention to aesthetics – by way of curating art collections – that are cognitively stimulating worthwhile investments, which promote the properties’ local ecosystems. Dr. Jim: How do you define “art” and what role does it play in today’s workspaces and guest areas? Elizabeth: “Art” is everywhere – it is the visual current that transcends any one particular item. It’s the creation of an aura – the visual thread that weaves through both public and private spaces in a hotel property. It’s the interaction of all the objects and – if executed properly – it takes ordinary objects and makes them extraordinary. Hotel art collections are the newest of all the amenities luxury guests require. It brings the “WOW!” appeal to a property or brand. Dr. Jim: What are the biggest mistakes owners or GMs make when decorating or establishing the aesthetic presence of a concept? Elizabeth: Designers tend to put more of a visual emphasis on their decorative aesthetics, such as fabrics, window treatments and furniture, rather than creating an integrated artistic aura. There is frequently a disconnect between the scale and style of the art and the furnishings. Designers sometimes miss the opportunity to use the artwork as an integral part of the entire visual design. Too many art programs feel like they are fulfilling a “designer’s formula,” where the artworks are selected specifically to “show off” either furniture or fabrics rather than to create an artistic story. My favourite hotel art collections have a residential “vibe” to them with a cerebral “quirky” twist. They incorporate playful, unexpected moments while appearing unstructured and impromptu. Dr. Jim: The “design and construction” function typically assumes responsibility for aesthetic considerations of spaces. What are the pros and cons of this, and what advice would you offer to developers? Elizabeth: On the plus side, design and construction teams understand the necessary steps of how to professionally get the project from start to finish. That said, they frequently have only a few stylistic formulas in their visual repertoire, which they continually tweak and re-tweak resulting in a myopic end product. To prevent such from happening, the design and construction function should simultaneous contemplate the “artistic” vision to create truly dynamic, innovative and cohesive interior and art collections. Also, there needs to be more focus on “art as the design” versus art being regarded merely as a supplement to the interior design. Dr. Jim: What role do consultants like you play in helping businesses incorporate art or more nuanced design to concepts or individual businesses? Elizabeth: Done correctly, consultants such as myself bring a unique vision and authentic artistic creativity to a project. We formulate the visual story line, establish the sense of place, complement the interiors without being obvious and generate “WOW!” moments that are subliminal. We stimulate guests’ feelings and leave them with long-lasting memories. Collections that are cerebrally stimulating and not just “pretty” are very powerful. Dr. Jim: What impact do hotel aesthetics and involvement with local cultural community have on the guests and their employees? Do artworks in the back of house have any purpose? Elizabeth: Over the past 5 to 10 years luxury hotels have taken the stance to develop well-curated art collections that rival museums in an effort to attract and retain guests; however, one of the few unmentioned peripheral effects is the impact it makes on the staff. When leadership includes local art and culture into their property, they are also educating employees about the local community, culture and heritage. Whether the hotel is on a remote island or in an urban metropolis, locals are beyond proud that ownership respects their community enough to tout their cultural uniqueness. Moreover, by having a comprehensive art program that exudes the local culture, it enables employees to develop a special bond with the properties and promote their local community. Retaining talent is always a crucial component for running a successful service-oriented business, and through successfully incorporating art in the back of house, it is another amenity in which employees will feel proud to work. Furthermore, when done correctly and with the inclusion of employees in the art collections and/or employee art education, they may be more vested in the property and, in turn, have longer careers at the hotel company. There are hundreds of self-empowering ways to include employees into the art program and spread a sense of deep honour in their role as a contributing member to the hotel team. Create an art concierge team who are knowledgeable about the artworks in the hotel and who can teach other employees about them. Create Employee Cultural Areas (ECA) in the back of house where every month a different employee can share which local artists they like. Create Employee Cultural Attachés who will highlight local cultural community events in the back of house area. Create employee art ambassadors for the property. Have employee hand-outs that describe the artworks. If cost permits, create a booklet/handout about the artworks and have both guests’ and employees’ comments in it. Create audio tours of the collection that both guests and employees can use while walking the property and viewing the artworks. Create a YouTube of the hotel’s art collection and share it with the employees. Bring in local artists, museum curators, auctioneers and others to talk with the guests and discuss local art happenings. Encourage employees to participate in these events so they’re fully involved with the local culture. As with everything else, this “perk” needs to be done correctly and with conviction. After installation, I always bring the hotel’s department heads and their selected employees on art tours of the property and supply them with information about the artists and the artworks in the hotel’s collection. As in front of house, artworks in the back of house elevate the morale and spirit of employees – plus add laughter and insight to their busy days. Dr. Jim: Please share an example of how you converted a “non-believing” stakeholder into someone who appreciated the powerful influence of art and aesthetics on consumer experience? Elizabeth: Several years ago I was invited to curate the collection for a luxury urban hotel. The designer selected and the client approved mid-range, somewhat decorative artworks instead of my first-choice recommended art. They purchased, and I installed it. Within a one-year period, upon showing ownership auction prices and substantial articles related to the value of creating a more esoteric “name artist collection” plus pressure from their property partners and art collectors in the neighbourhood, they realized that they needed to display artworks that befit their level of luxury. We relocated the more decorative pieces into secondary locations and purchased a dozen large-scale substantial artworks. As a result of altering the art plan, the collection has received major kudos from their guests, local collectors, galleries and even museum critics. Dozens of guests have told the hotel’s concierge how much they are moved by the collection that I created. In turn, I could not ask for a better compliment than when the concierge calls me to share their guest’s reactions, especially as many of these people are art collectors themselves. It is one thing to hypothesize a thesis; it is another thing when you have substantiated and delivered on it to multiple GMs and owners with conviction and 30+ years of proven results.